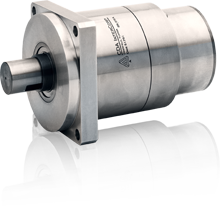 Providing the highest mechanical power output and torque per unit volume, the Brushless Permanent Magnet Motor (BPMM) is the workhorse of the motor line family. These high performance motors require an integral motor rotor position indicator in order to maximize motor performance and operation.<br><br>The rotor is constructed with durable rare earth samarium cobalt magnets for high temperature performance, stability, and durability. The electrical windings are on the outside stationary stator, providing minimal thermal resistance between the windings and the motor case.